There’s a time when everyone talks about how strong and uncompromising Interlude for Men smells; how it is not for everyone, but if you like it you are a perfume connoisseur. Or how people around you might get offended if you wear too much of it; and how fun it was to “accidentally” wear 20 sprays and kill everyone in Sunday church. Probably those are the reasons why men want a bottle, to tell the world that I am a bad boy, I am a nonconformist. What’s in Interlude for Women? There is only one note: magic pencil. Some people said it smelled like Jolly Rancher, I think they are crazy, because it clearly smells like a magic pencil to me – it’s dense, dark, rich, a little sweet and a little floral and woody like a pencil. (Note: upon research, most pencils are made from “incense cedar”.) I went to Fragrantica in glee to verify my guess, and holy moly, it said it had bergamot, ginger, lemon, marigold, incense, rose, jasmine, tuberose, walnut (really? ), coffee (didn’t get it), kiwi (what? ), honey, immortelle, sandalwood, opoponax, vanilla, leather, oak moss, amber, frankincense, tonka, musk and guaiac? Hey, these ingredients all have very distinct personality, but when the perfumer of Interlude blended them together, it’s almost too hard to tell them apart, like I can’t believe mayonnaise is made of egg, vinegar and oil. Interlude for Women is one of the heaviest scents “for women” that I have encountered. It doesn’t break down, it smells the same from start to finish and it wears me down like a heavy coat. After wearing Interlude for Women for more than five times, the magic pencil note finally unravelled a little bit. I focused and could detect the incense (that’s almost a given for an Amouage perfume), honey and guaiac. It will take me a while to recognize the other notes. But I need strength to wear it. Mists of aroma get applied to the body layer by layer, first with a feathery light base coat of resins, musks and golden amber, then slightly darker and richer colors of patchouli, rose and incense, not very strong, but they are there. Lastly, fine mists of ylang, lemon and tarragon, whitened to a pastel palette by the powdery labdanum, gives it a smooth warm fruity hue. A final layer of aldehyde is applied to give it a bright and light sheen. No dripping, no fingerprints, just gloss and the reflection of your smile. The LCD panel slowly sinks back in, and you are greeted by the look of yourself in the rear view mirror finding a glamorous, not bitchy, sophisticated woman, even if you are a man. Now, reach in your invisible handbag and get that pair of retro sunglasses and Hermes scarf and wear them. Yes, perfect. Sorry, I got carried away. Yes, men can wear it. I think. I can’t stress how much I love aldehydic perfumes, with Arpege being my number one. Now with Jubilation 25, I’m afraid there is going to be a spectacular WWE fight between the two Victorian ladies, slapping each other’s face with their pocket folding fans. Jubilation 25 doesn’t smell revolutionary, actually almost like a tribute to all fine aldehydic chypre perfumes of the 80s – except that the materials smell richer and yet the perfume wears lighter – how strange is that? I remember in a first-year Science class experiment, we try to roughly find out how big an oil molecule is: First, a large tray filled with water is sprinkled on top a generous amount of baby powder, completely covering the surface. Then 1 mL of oil is dropped in the middle and it spreads, pushing the baby powder away. A rough measurement of the dimensions of the “oil spill” can be found, and we can deduce the “height” of an oil molecule. The whole experiment is extremely rudimentary, but I was quite impressed by the visual aspect of fast pushing action of that little droplet. The same impression is re-experienced again, believe it or not, through a spraying of Amouage Fate for Woman, which has the same “high speed boom! then everything slows down” effect on me, but this time completely 3D and olfactive. That spray of Amouage Fate for Woman, damn, is like an explosion of a firework bomb, carefully designed that aims to win some international fireworks competition. The outermost layer is baby powder (labdanum) and pepper, followed by some of the densest florals I have ever smelt – rose, jasmine, narcissus; and in a second the innermost core explodes and it’s incense, cinnamon, amber and patchouli. No one ever walks away from a fireworks show, and I just have to stare at the spectacle with my nose. Despite all the colours and richness, strangely, the lasting power of Fate for Woman on me is also like a firework, gone too soon, but the rich spicy/incense base notes linger for hours. 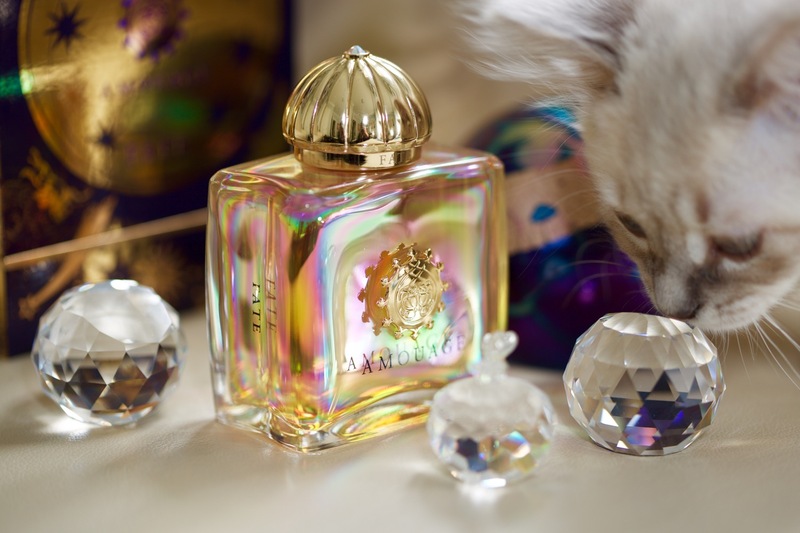 The powdery/rose design is not new, but Fate has a distinctly Middle-Eastern flare that makes it so exotic and rich. Next time you see me frozen in my chair with my forearm risen up against my nose and eyes not moving, I am not rebooting myself, I am admiring Fate for Women. My rating: a million stars. There are a few Amouage perfumes for women that I really like (Fate, Ubar, Gold for Women), but Journey for Women won my heart in a split second. Before I made my purchase, I had visited Fragrantica for readers’ comments – woah, why all the hate? People say it doesn’t smell like other Amouage perfumes, which are heavy, spicy, bombastic, and beastly… but that’s exactly the reasons why I like Journey for Women – it’s fresher and lighter. If Journey for Women were a woman, she has a pretty sweet face, just 30 years old, but, on the first date you realize she isn’t as immaculate as you’ve imagined – just like most Chinese after the revolution, her favorite past time activity is chain smoking. Well, she only likes the smell of tobacco leaves, she says… The tobacco in Journal for Women adds an extra layer of sensuality to this perfume and It’s a pleasure to wear… I would like to stay a bit longer instead of going forth on a journey West. 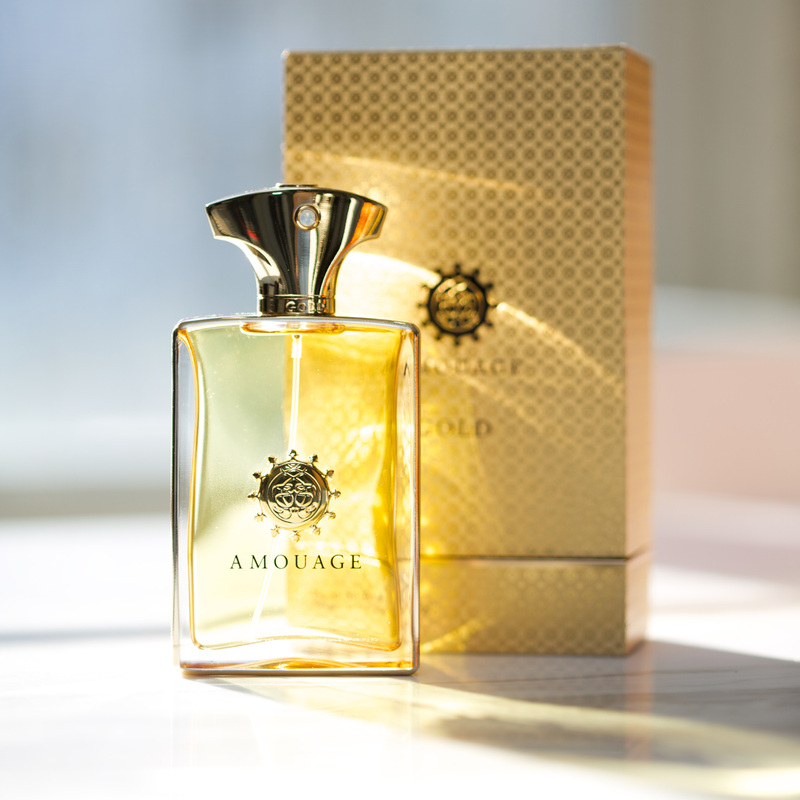 I am no expert on Amouage perfumes, but I am almost certain that if Amouage were a country and needs to recruit an army, all they need to do is say “please”. And it will be the best smelling army in the world for sure. When I first started exploring their line, I tested the little samples I ordered from Lucky Scents. My expectation was so high, I was prepared to have my socks knocked off. But one after another, I felt so puzzled because there wasn’t one that I felt very drawn to, until I smelled Gold for Men (1998). My reaction was almost like those women in a chocolate TV commercial, in which she puts a piece of rich and creamy chocolate in her mouth, closes her eyes, tilts her head up, her face exuding an orgasmic pleasure. I will cut to the chase – if I get married, or I am lying in an open casket, I will be wearing Gold for Men. Because it smells so expensive, formal, powdery, floral, romantic, musky, classy and classic, when I am wearing it, I feel like I am a 6 foot 5 czar wearing a vintage mink coat and pair of sunglasses spreading caviar on a cracker. However, under normal circumstances, wearing it is almost overkill, particularly in summer. Got this bottle from eBay at a relatively good price. I totally dig the packaging. 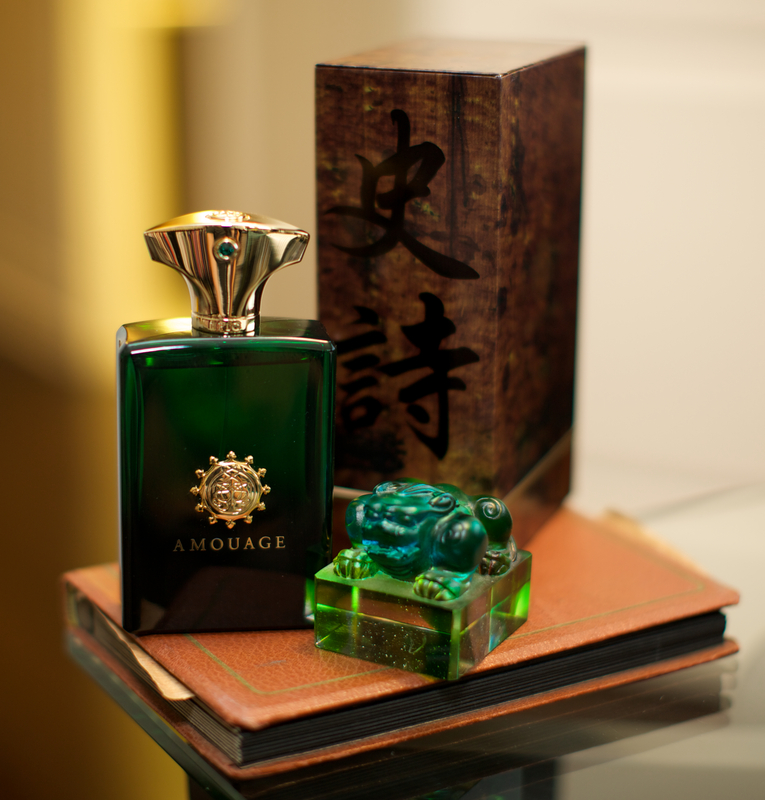 The creative director of Amouage, as many have already known, is Christopher Chong, a man from Hong Kong. He’s good at his job, but I often wonder, how did he land on that job. I mean, he must have some very good social connections and given a perfect opportunity. 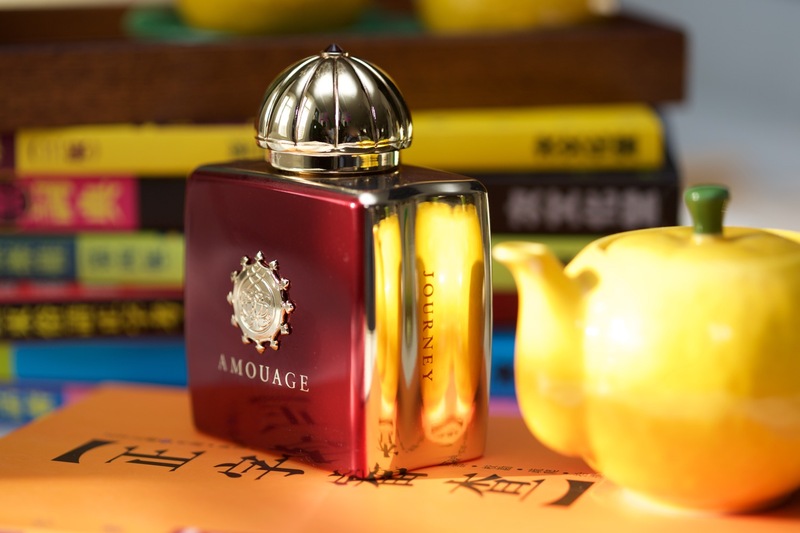 The good and bad thing about Amouage perfumes is that for each scent, they have a man’s version and a woman’s version (well, the smart guy created the Opus line, which is for unisex, I suppose.) 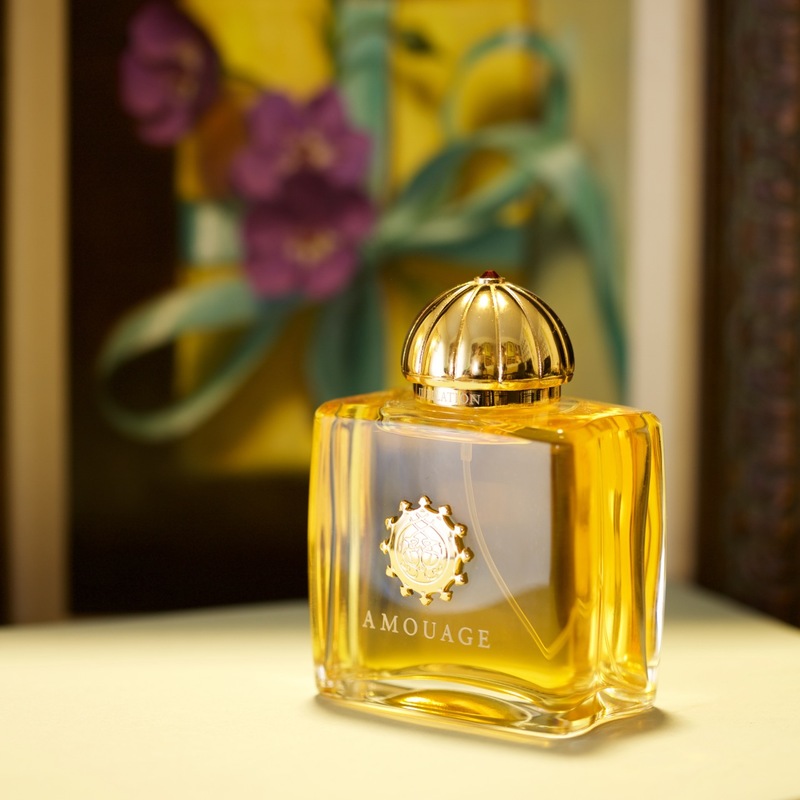 I didn’t spend much time checking out the woman’s version; I probably have missed some really good Amouage perfumes for women. Any recommendation?